HCII – Housing and Community Initiatives, Inc. 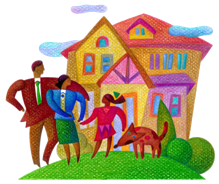 Welcome to Housing & Community Initiatives, Inc.
Our Mission: To enable low and moderate income households to achieve their homeownership goals by providing education - the first step to housing success. Thank you, Thank you to our Volunteers! Montgomery County's First-time-homebuyers. Interested in teaching? . HCI conducts pre- and post-purchase education sessions given by real estate professionals that cover the entire process of buying and successfully maintaining a home in Maryland. HCI also administers the MPDU Orientation session on behalf of the Montgomery County DHCA. These classes are required by many state and county home buyer assistance programs. Home-buyer classes are free but registration is required. Please visit our Schedule and Online Registration. The City of Rockville's "Real Estate Effort for Affordable Community Housing" programprovides first-time home-buyers with down payment and/or closing cost assistance. The program gives 0%, 7-year loans up to $12,000 to purchasers who currently live and/or work in the incorporated city limits of Rockville and plan to buy their first home there.